Is home where you are from, or where you are? This is a question I have been contemplating over the last couple weeks as Karen and I have returned “Home” to Calgary to touch base and visit family and friends before heading off to Australia in 4 weeks. I would be curious to hear thoughts on this. One of the advantages of slow travelling and spending longer periods of time in locales is you actually develop some friendships and truly come to like some of the people you spend time with. This is all wonderful, until it comes time to leave. The hardest part of leaving Costa Rica was saying goodbye to our friends there, and the same dilemma reared its head as we readied for our departure from Belize. Saying goodbye to the staff at the dive shop was sad, and saying good bye to our favourite dive masters and friends, Ian and Beth, was truly difficult. As well, further north on the island at The Palapa Bar we had to say goodbye to some great people we have grown to like and enjoy, especially Ivan and Abner. Thank you to all for making us feel so welcome and at home. 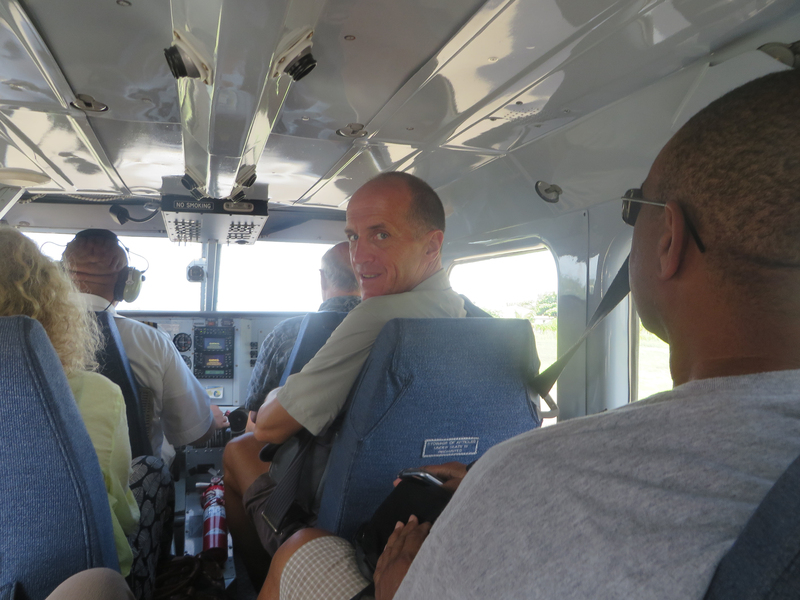 Getting ready to depart San Pedro, Belize on board Tropic Air. Once we had said our good byes and packed our bags (which still weigh too much but are 100lbs lighter than when we started) we headed off to the airport in San Pedro. Despite the fact that our bags have consistently been at least 20lbs over weight for every flight we have been on in the last 21 months, we have yet to have to pay anything in overweight fees. Our luck nearly ran out in San Pedro as we checked in with a new clerk in training with Tropic Air in San Pedro. The supervisor made a point of having the young fellow come out and explain to us that because we had too many bags they would not all fit on our plane. After apologising for the problem we were causing him we asked him how long we would have to wait for all of our bags to arrive in Belize City. “10 minutes” he says. I love flying with Tropic Air. They just keep sending planes until everything is transported. One of the best reasons to upgrade when you are able to. Being able to stretch out your legs is bliss while flying. For our flight from Belize City to Calgary, via Houston, Karen was able to upgrade us to first class on United for about $100 each. Best investment ever. 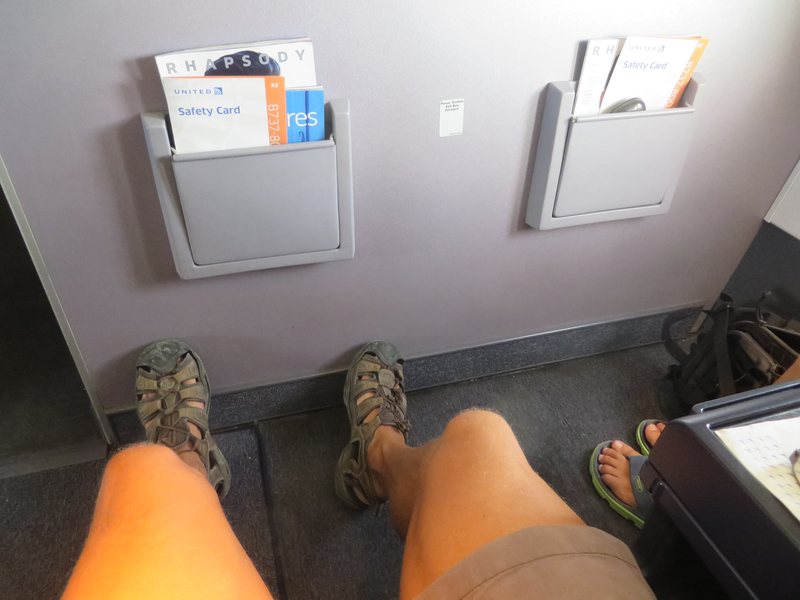 Between the leg room and the complimentary drinks it was well worth the cost. The service is great as well as the quality of the food was outstanding. 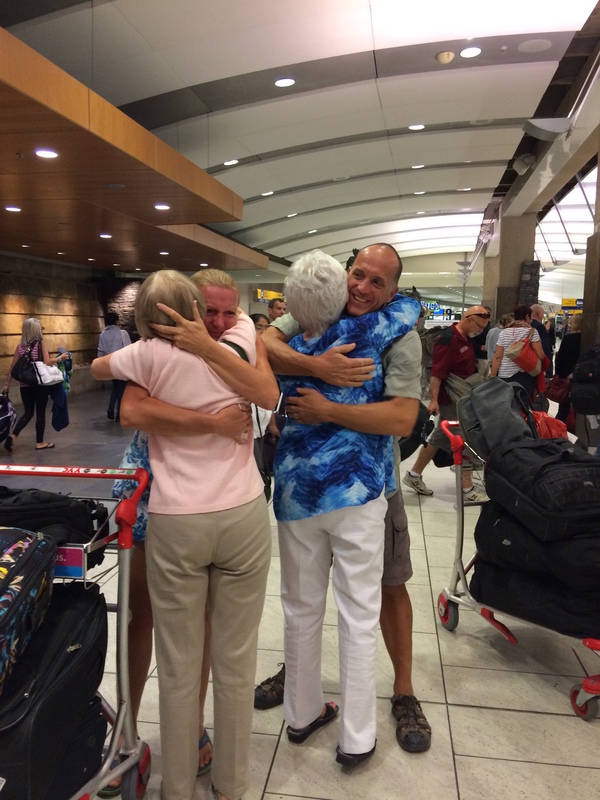 There is nothing quite like the hug from your mother when you have been away for 21 months. Both Karen and I deal with being away from family very well. We rarely suffered any type of “home sickness” during our travels. However, when you walk out of arrivals at the airport and see family lined up waiting for you and have your mother crush you in a hug saying she has missed you so much. Let us just say there are not too many dry eyes in the area. I had successfully tucked those feeling away while we had been in Central America, but when faced, eye to eye with the ones you love it does bring home the toughest part of choosing a nomadic type lifestyle. Loving the experience of cruising with the top down in a beautiful Ford Mustang. 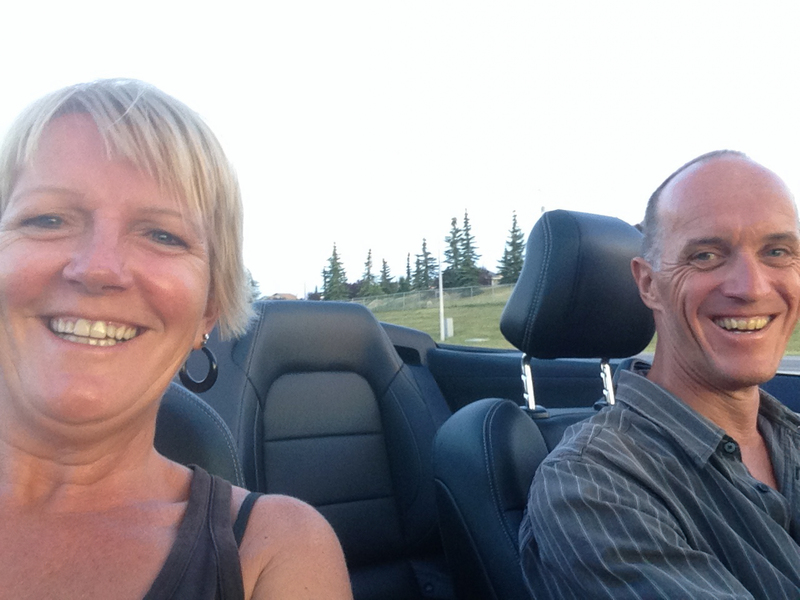 Some of the benefits of visiting with friends and family are when your friend insists that you use his 2015 Ford Mustang GT convertible to drive around Calgary visiting friends. What a sweet ride, thank you Richard! Being able to enjoy a delicious dinner with our boys has been a highlight of being in Calgary. The most common question that we have heard is “Is it good to be back?” or some variation of that. It is an interesting question and one that causes me to examine how I truly do feel about being back in Calgary. After the first two weeks back the answer is , not really. It is wonderful to be able to touch base and visit with friends around the city and both Karen and I are very excited to be heading out for a two week road trip visiting friends in Alberta and British Columbia. As well, being able to spend time with our families is truly heartwarming and satisfying. However, the physical act of being here really does nothing for me. Calgary is a place I grew up and had a career. I know it intimately and love the beauty of the city and surrounding area. However, what provides the draw to be here is the people, not the place. Back to that question about, what is home? We have four more weeks in Calgary and are looking forward to spending time with more friends and family before heading off on the next chapter of our adventure. Life is very good. Well, to me I think that perhaps home is truly where your story begins, but some of us are fortunate enough to find a home away from home. I know those are such cliches, but it is how I feel about my happy place in Punta Mita Mexico.. It is my home away from home. You and Karen will simply have more homes away from where your stories began.